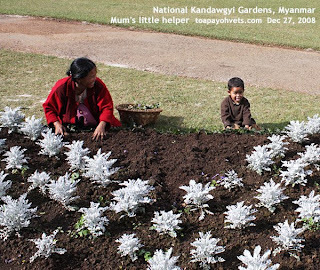 Pyin Oo Lwin gets a thumbs up from my family. It is a beautiful and cool low humidity garrison town. Not a hardship tour as hotel accommodation at The Governor's House is 5-star. There are smaller chalets which cost much less than living in the recreated Governor's House. I have 3 pictures for viewers and these are my reflections after viewing the pictures and visiting Kandawgyi Gardens. 1. Tourism is down in Myanmar for the past 2 years unlike Singapore which has outpriced itself in charging high hotel rates. In Pyin Oo Lwin and other parts of Myanmar, the hotel rates are value for money. The average Singaporean family can stay in 5-star hotels of The Governor's House without being bankrupted. Just 2 days ago, I asked an ex-Singaporean why he stayed at the Swiss Hotel in Singapore when I sent him and his family back to the hotel after dinner. He said, "Why save money for my children to spend?" He could afford to indulge in staying in a 5-star hotel in Singapore, having sold out his shares just before the stock market crash. I doubt the average Singaporean can afford Singapore's 5-star hotel. 2. 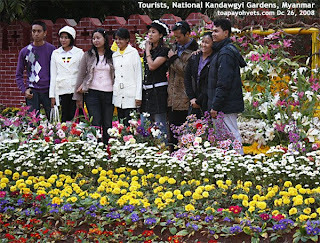 The flower festival at the National Kandawgyi Gardens is in November and December. The scenery reminds me of China's Chairman Mao's "Let a thousand flowers bloom" campaign. Lovers of history will know of the sad consequences. For those who had seen the martial arts movie "Ip Man", see the young man with an oval shaped face and big eyes. He looked like the younger version of the Japanese General acting as the antagonist to Ip Man in the movie. Many female movie goers go for the handsome actor in the movie and the antagonist's eyes were charismatic and remembered by one lady in her 20s after viewing the movie! Looks do count in life. 3. Flowers in bloom. Children are expensive to bring up in Singapore as they go to school for many years. The younger generation seems to be careful - one child is enough. In a way, the younger generation is smarter as they have more spending money. Go on tour and live life to the fullest as there is no guarantee that children are excellent investments. Many young men die young due to their lifestyles. When they should be "flowers in bloom", they don't take care of themselves, get into drink driving and drugs or murders and robberies. 4. "Mum's little helper" photo. Bringing up a male child is very difficult. I just read about the young man who went out past midnight in Chinatown as this is what young men loved to do. He was killed by a gang arising out of a "staring incident". Several young men in Singapore died in crashing their cars due to drink driving or speeding thrills or getting involved in bike accidents. 5. "Smell the roses". 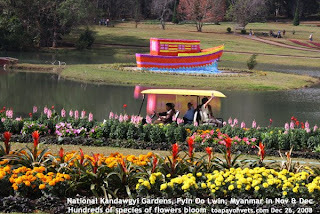 For those over 50 years who can't walk or who have no appreciation for flowers at the Kandawgyi Gardens in November and December, a tram ride is available. When you are in your 30s, walking and hiking in Myanmar enable you to "smell the roses", the fresh countryside air. Instead of going from Point A to B in a tram ride, walk and check out the varieties of flowers and vegetables planted in the Gardens, de-stressing yourself. In conclusion, Pyin Oo Lwin is not a "hardship" tour for the Singapore wife who dislikes discomfort and unexpected blackouts. No bumpy roads from Mandalay. Cool climate. Low humidity. Myanmar Tourism helps the ordinary residents to earn a living as more tourists lead to increased employment of the villagers and improving their standard of living. Instead of going to Australia's Gold Coast for the 3rd time, why not bring your children and wives to Pyin Oo Lwin? Singaporeans interested in tourism in Myanmar, e-mail judy@asiahomes.com or tel +65 9668-64686 and I will make some arrangements for you.